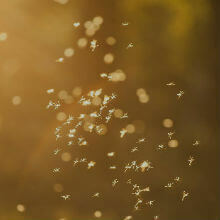 Gnats is a term used to describe a range of flying insects that tend to crop up during the British summertime. While they can be a pest to deal with, gnat bites aren’t usually serious and it’s very rare to experience an allergic reaction after being bitten. However, some gnats can pass on bacteria from other things they’ve landed on, like dead animals or rotten food, which can lead to infections when they feed on people. If you’ve been bitten by a gnat and are experiencing any worrying symptoms - speak to a doctor online now. Our GPs can examine the affected area, talk through your symptoms and provide treatment to help clear the problem up. What causes problems with gnat bites? In a similar way to midges and mosquitos, gnats feed on the blood of animals and can often find humans to be a tasty snack. Unlike mosquitos, gnats don’t have specially-adapted tools for sucking blood and will simply tear at the skin using the sharp parts of their mouth. Once they’ve broken through, they spit an anticoagulant into the wound that stops the blood from clotting and allows them to feed at their leisure. While they don’t usually carry diseases that can be passed on to people, they may pick up bacteria as they feed, which can cause serious infections if left untreated. The chances of this happening can be increased if the wound is reopened or made worse from scratching. Allergic reactions to gnat bites are rare, but some people may react badly to the anticoagulant mixture used by gnats when feeding. In most cases, you can treat a gnat bite at home - using soap, water and an antiseptic to clean the wound and minimise the chances of a bacterial infection taking hold. Gnat bites are often itchy, but an over-the-counter cream is usually enough to tackle this until the bite has healed. One of the key signs of bacterial infections developing are pus-filled blisters and you should see a doctor if these do crop up in the area where you’ve been bitten. If you’re bitten and experience a severe allergic reaction, like breathing problems, swelling in your throat, mouth or other places on your body where you weren’t bitten - you should seek emergency medical help as soon as possible. To prevent gnat bites, it’s well worth investing in an insect repellant spray, especially if you’re going to an area that’s known for gnat infestations. Gnats love moisture and if you find you’re being plagued by outbreaks in and around your home, you should check for standing water. If you’ve been bitten by a gnat and are experiencing any worrying symptoms, or think a bacterial infection might have set in, don’t delay - see a doctor online now. Our GPs can examine the affected area, talk through your symptoms and if necessary, prescribe medication to help clear up bacterial infections.